Neither quantum computers nor quantum cryptography will become prevalent technologies without memory systems able to manipulate quantum information easily and effectively. The Faculty of Physics at the University of Warsaw has recently made inroads into popularizing quantum information technologies by creating an atomic memory with outstanding parameters and an extremely simple construction. Following years of tests in physics laboratories, the first quantum technologies are slowly emerging into wider applications. One example is quantum cryptography – an encryption method providing an almost full guarantee of secure data transmission, currently being introduced by military forces and banking institutions. Processing quantum information and sending it over long distances has so far been severely limited due to a lack of adequate memories. A solution is now within reach: the Faculty of Physics at the University of Warsaw (FUW), Poland, has created a fully-functioning atomic memory with a simple, reliable construction and numerous potential applications, including in telecommunications. “The greatest challenge in the construction of our quantum memory was the precise selection of system parameters that would allow it to save, store and read quantum information effectively. We have also found a novel way of reducing noise during detection,” says Dr. Wojciech Wasilewski (FUW). Contemporary fiber-optic communications involve the transmission of classical information using laser light propagated inside optical fiber cables. Attenuation causes the light signal in the optical fiber cable to weaken as the distance it travels increases. When long optical fiber cables are used, laser amplifiers multiplicating photons are placed along them at intervals of approximately 100 km. These turn a weak signal comprising a low number of photons into a strong signal with high numbers of photons. However, in quantum communications it is the individual photons and their quantum states that are important. Here signal amplification of the signal does not simply mean increasing the number of photons, but rather preserving their original, undisturbed quantum states. Unfortunately, quantum information cannot be duplicated with impunity: performing any measurement of the quantum state of the photon will inevitably affect its original state. The impossibility of quantum cloning, co-discovered by the Polish physicist Prof. Wojciech Żurek, places fundamental limitations on the operations that can be conducted on quantum information. In 2001, a team of physicists from the University of Innsbruck and Harvard University proposed the DLCZ quantum transmission protocol, making it possible to send quantum information over long distances. Under this protocol, quantum information reaching each relay point along the channel must be stored there for a sufficiently long time to ensure that attempts at transmitting it to the next node are successful, as confirmed via a normal signal. In such a protocol, therefore, a key role is played by quantum memory in which quantum information needs to be stored for a sufficiently long time. “Until now, quantum memory required highly sophisticated laboratory equipment and complex techniques chilling the systems to extremely low temperatures approaching absolute zero. The atomic memory device we have been able to create operates at far higher temperatures, in the region of tens of degrees Celsius, which are significantly easier to maintain,” notes Radek Chrapkiewicz, doctoral student at the Faculty and co-author of the paper in the renowned journal Optics Express. The main element of the memory device constructed by the University of Warsaw physicists is a glass chamber 2.5 cm in diameter and 10 cm long, with rubidium-coated sides, filled with a noble gas. When the tube is heated gently, rubidium pairs fill the inside, with the noble gas restricting their movement and thereby reducing noise. When quantum information is stored in such a memory, photons from the laser beam “imprint” quantum states on many rubidium atoms. Other photons are emitted at the same time; their detection confirms that the information has been saved. Information stored in the memory can then be retrieved using another specially selected laser pulse. 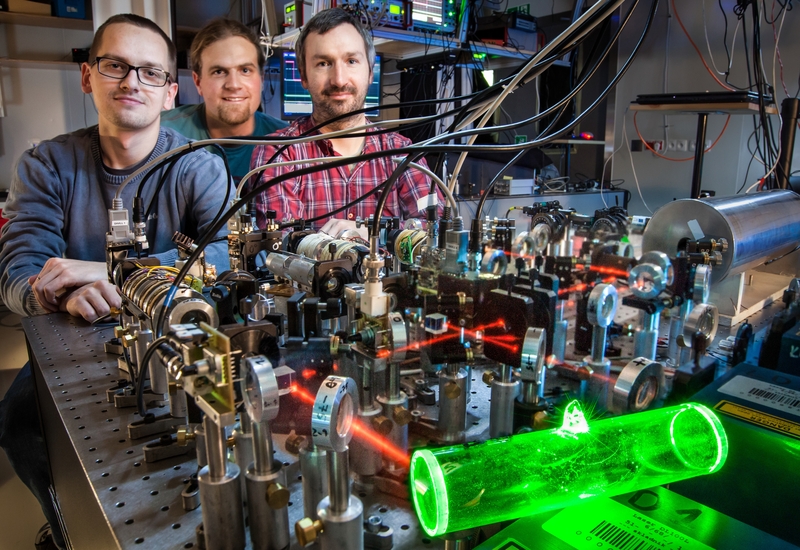 To record and retrieve quantum information, the researchers used advanced methods of light filtering (patent pending) and an innovative camera of their own design. This camera, able to detect individual photons, is characterized by extremely low noise levels and a speed tens of times higher than existing cameras. “The stability of the quantum information stored in our memory lasts from a few microseconds up to tens of microseconds. You’d be forgiven for asking how such short-lived memory could be useful at all, but bear in mind that it depends on the application. In telecommunications, microsecond timescales are sufficient to conduct several attempts at transmitting a quantum signal to the next relay station,” stresses Michał Dąbrowski, a doctoral student from the Faculty. Skillfully harnessing subtle quantum optics phenomena has enabled the University of Warsaw researchers to significantly reduce noise levels in the quantum signals. When the information is retrieved, most of the noise is carried away by photons which are emitted by the memory cells in a different direction than the photons carrying the relevant quantum information. A single atomic quantum memory cell, as developed at the Faculty of Physics at the University of Warsaw, can also store light with several different spatial modes (types of vibration). This means this is currently the solution with the highest capacity. In real quantum telecommunications applications, a single cell of this new type could serve as a buffer memory for several fiber-optic cables concurrently. This work on atomic quantum memory cells received funding from the Polish National Research Centre. Physics and Astronomy first appeared at the University of Warsaw in 1816, under the then Faculty of Philosophy. In 1825 the Astronomical Observatory was established. Currently, the Faculty of Physics' Institutes include Experimental Physics, Theoretical Physics, Geophysics, Department of Mathematical Methods in Physics and an Astronomical Observatory. Research covers almost all areas of modern physics, on scales from the quantum to the cosmological. The Faculty's research and teaching staff includes ca. 200 university teachers, of which 88 are employees with the title of professor. The Faculty of Physics, University of Warsaw, is attended by ca. 1000 students and more than 170 doctoral students..
News Release Source : Global Quantum Communications – No Longer the Stuff of Fiction? While the Martinis Lab at UC Santa Barbara has been focusing on quantum computation, former postdoctoral fellow Pedram Roushan and several colleagues have been exploring qubits (quantum bits) for quantum simulation on a smaller scale. Their research appears in the current edition of the journal Nature. "While we're waiting on quantum computers, there are specific problems from various fields ranging from chemistry to condensed matter that we can address systematically with superconducting qubits," said Roushan, who is now a quantum electronics engineer at Google. "These quantum simulation problems usually demand more control over the qubit system." Earlier this year, John M. Martinis and several members of his UCSB lab joined Google, which established a satellite office at UCSB. In conjunction with developing a general-purpose quantum computer, Martinis' team worked on a new qubit architecture, which is an essential ingredient for quantum simulation, and allowed them to master the seven parameters necessary for complete control of a two-qubit system. Unlike a classical computer bit with only two possible states -- 0 and 1 -- a qubit can be in either state or a superposition of both at the same time, creating many possibilities of interaction. One of the crucial specifications -- Roushan refers to them as control knobs or switches -- is the connectivity, which determines whether or not, and how, the two qubits interact. Think of the two qubits as people involved in a conversation. The researchers have been able to control every aspect -- location, content, volume, tone, accent, etc. -- of the communication. In quantum simulation, full control of the system is a holy grail and becomes more difficult to achieve as the size of the system grows. "There are lots of technological challenges, and hence learnings involved in this project," Roushan said. "The icing on the cake is a demonstration that we chose from topology." Topology, the mathematical study of shapes and spaces, served as a good demonstration of the power of full control of a two-qubit system. In this work, the team demonstrates a quantum version of Gauss's law. First came the 19th-century Gauss-Bonnet theorem, which relates the total local curvature of the surface of a geometrical object, such as a sphere or a doughnut, to the number of holes in the object (zero for the sphere and one for the doughnut). "Gauss's law in electromagnetism essentially provides the same relation: Measuring curvature on the surface -- in this case, an electric field -- tells you something about what is inside the surface: the charge," Roushan explained. The novelty of the experiment is how the curvature was measured. Project collaborators at Boston University suggested an ingenious method: sensing the curvature through movement. How local curvature affects the motion can be understood from another analogy with electromagnetism: the Lorentz force law, which says that a charged particle in a magnetic field, which curves the space, is deflected from the straight pass. In their quantum system, the researchers measured the amount of deflection along one meridian of a sphere's curve and deduced the local curvature from that. "When you think about it, it is pretty amazing," Roushan said. "You do not need to go inside to see what is in there. Moving on the surface tells you all you need to know about what is inside a surface." This kind of simulation -- arbitrary control over all parameters in a closed system -- contributes to a body of knowledge that is growing, and the paper describing that demonstration is a key step in that direction. "The technology for quantum computing is in its infancy in a sense that it's not fully clear what platform and what architecture we need to develop," Roushan said. "It's like a computer 50 years ago. We need to figure out what material to use for RAM and for the CPU. It's not obvious so we try different architectures and layouts. One could argue that what we've shown is very crucial for coupling qubits when you're asking for a full-fledged quantum computer." Lead co-authors are UCSB's Charles Neill and Yu Chen, of Google Inc., Santa Barbara. Other UCSB co-authors include Rami Barends, Brooks Campbell, Zijun Chen, Ben Chiaro, Andrew N. Cleland, Andrew Dunsworth, Michael Fang, Julian Kelly, Nelson Leung, Anthony Megrant, Josh Mutus, Peter O'Malley, Chris Quintana, Amit Vainsencher, Jim Wenner and Ted White, as well as Evan Jeffrey, Martinis and Daniel Sank of Google Inc., Santa Barbara, and Michael Kolodrubetz and Anatoli Polkovnikov of Boston University. This work was supported by the National Science Foundation (NSF), the Office of the Director of National Intelligence and the Intelligence Advanced Research Projects Activity. Devices were made at the UCSB Nanofabrication Facility, part of the NSF-funded National Nanotechnology Infrastructure Network and the NanoStructures Cleanroom Facility. A new scientific journal focusing on the rapidly developing areas of quantum research that promise to revolutionise the processing and transmission of information has been launched today at UNSW by the Federal Minister for Education Christopher Pyne. npj Quantum Information is an international open-access journal and the first Nature Partner Journal based in Australia. Professor Michelle Simmons, Director of the Australian Research Council Centre of Excellence for Quantum Computation and Communication Technology at UNSW, has been appointed to the prestigious role of Editor-in-Chief of the journal. npj Quantum Information will combine research at the forefront of quantum computing, quantum communication and quantum information theory, covering topics including optics, atomic physics, semiconductor physics, superconducting physics and computer science. Recent advances in instrumentation mean matter can be manipulated at the smallest scales – at the level of single atoms of matter or single photons of light. Scientists predict these areas of research will bring dramatic increases in computational power, and the ability to transmit information absolutely securely. She highlighted the importance of the open access model for scientific journals: “While discovery is converging across fields, advances are still reported in disparate journals. “The ARC plays an important role in the global research effort – the race to develop the quantum computer could be the space race of the 21st century,” said Federal Education Minister, the Hon Christopher Pyne MP, who toured the ARC Centre of Excellence laboratories at UNSW. “Australia has a reputation for excellent research of international standing. The ARC Centre of Excellence for Quantum Computation and Communication Technology is strengthening this reputation and the new Nature Partner Journal will provide an important focus on this rapidly changing and exciting area of research,” he said. David Swinbanks, Managing Director of Macmillan Science and Education, Australia and New Zealand said: “This launch is particularly exciting because it is our first partner journal partnered with an Australian institution. “npj Quantum Information will be open access, free immediately upon publication for anyone who wants to read it. The open access model is especially important in the field of quantum information where the research is growing rapidly but has historically been fragmented. Our hope is that open access will stimulate sharing of ideas across these communities. Additionally, it will facilitate knowledge transfer to up and coming entrepreneurial businesses that are springing up in this area,” Mr Swinbanks said. npj Quantum Information is now accepting submissions. Professor Simmons anticipates that the journal willpublish papers from both fundamental and applied areas, which could include reports about the fundamental relationship between quantum mechanics and information, the practical steps that are being taken to realise a quantum computer, algorithms opening new pathways for quantum information processing, exquisitely sensitive quantum sensors, the development of secure quantum communications across a global scale and emerging applications of quantum entanglement such as teleportation. Professor Simmons is a world leader in the field of quantum computing and holds an ARC Laureate Fellowship at UNSW. She has published more than 350 papers in refereed journals including Nature, Nature Nanotechnology, Nature Physics, Nature Materials and Nature Communications. In 2012, her research group developed the world’s smallest transistor, marking a technological achievement 10 years ahead of industry predictions. Her laboratory is the only one in the world able to make atomically precise devices in silicon, including the thinnest conducting wires yet produced, which are 1000 times narrower than a human hair. A member of the Australian Academy of Science since 2006, she was named NSW Scientist of the Year in 2012. In 2014, she became an elected member of the American Academy of Arts and Sciences.